Marathon Man started running barefoot last summer. That's right no shoes. Just his bare naked feet slapp'in the pavement. Crazy? I thought so. But guess what? Not one of the ugly predictions made by many (including me) came true. He hasn't had one injury. No sliced toes from broken glass. No holes in heals from embedded rocks. No Avian (bird) flu from stepping in poo (damn those Canadian Geese!). Seriously not one injury. When winter came (and remember we get chilly ones) he kept on at it but obviously his feet needed some kind of protection. So he started running in Vibram fivefingers®. A year has past and he's still running barefoot and still singing it's praises. 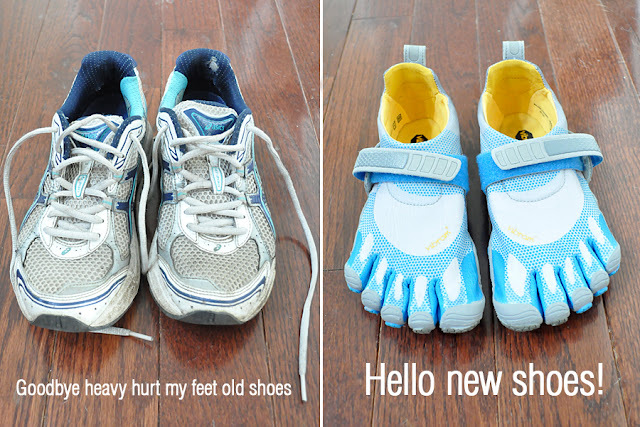 So...when I went off the other day on how much I hated my running shoes, couldn't wait to get them off after every run and how my feet felt like the were on fire...he suggested that I try Vibram fivefingers. Hmmm...(that's about how long I thought about it). Why not? 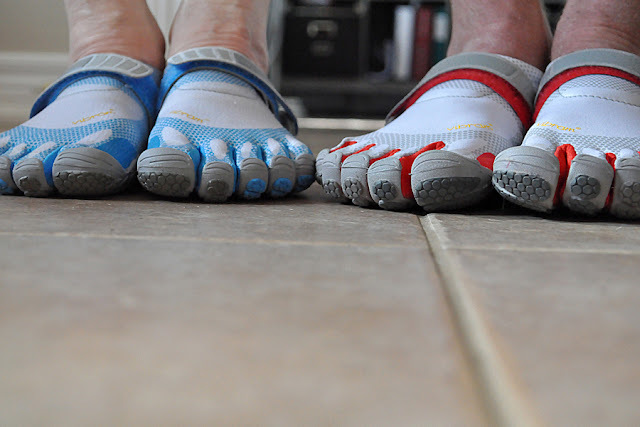 This is us in our Vibram fivefingers. Hi Mel, it's very tricky. Marathon Man has already ensured me that it gets easier. I have a rather large second toe (a sign of intelligence;) Who knows if that'll be a problem? Time will tell.